My days are full. If you could see my calendar you’d wonder when I have time to sleep. It’s crazy, sometimes. And I have a family member with some health issues and I will be traveling out of town 2 – 3 days a week helping my family out to add to my busy schedule. It gets tough trying to make a hearty dinner at home with everything going on. So what’s a busy mom to do? Manwich to the rescue! Who doesn’t love sloppy joes? Thankfully, my family does. And with three different flavors of Manwhich to choose from, there’s something for everyone. There are so many evenings when we are so rushed to get from one place to another, that having a hot dinner is just difficult to fit in. And I want something more satisfying for my son than a cold sandwich. 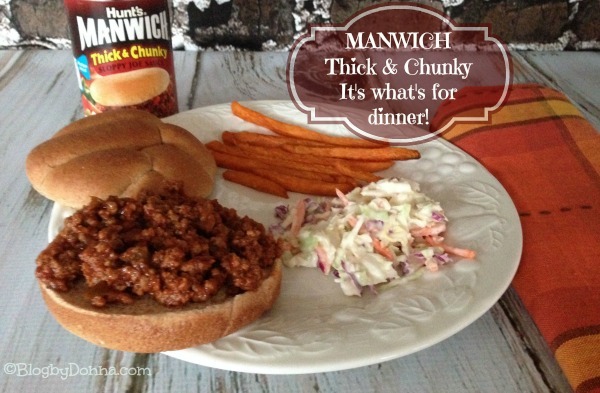 With Manwich, I can have dinner on the table in 15 minutes and I know my son and husband will have a hot, satisfying dinner. The winner was the Manwich Bold Sloppy Joe Sauce. It has a “bold” (but not too bold) rich flavor that my family really enjoyed. I made some cole slaw to add to the top of our sandwiches and a side of sweet potato fries and we had a delicious, hearty dinner. The Manwich Thick & Chunky Sloppy Joe Sauce was a close second. I actually liked it just a bit more than the Bold flavor, but since my husband and son liked the Bold the best… majority rules. I made a side of tri-color slaw and sweet potato fries to go along with our Manwich Thick & Chunky. My son was home from school break one day and I was needing a quick lunch and decided to fix him the Manwich Original with a side of chips. He was quite happy. I made all my sloppy joes using lean hamburger, but you can easily use ground turkey. I also love that I usually have leftovers for the next day. When you’re an on-the-go mom like me — that’s such a timesaver. 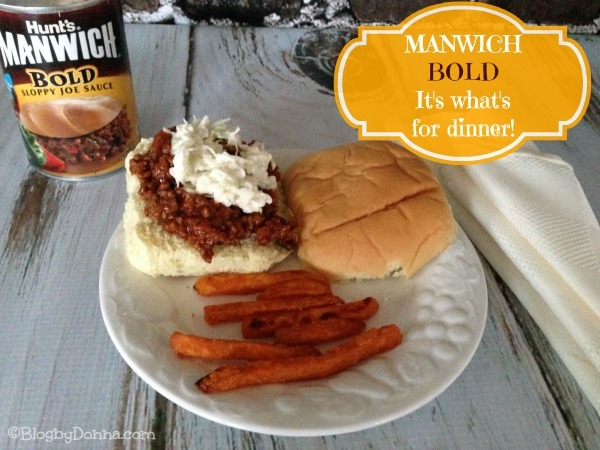 As a mom what I like best is that each can of Manwich is free of artificial flavors and preservatives and offers a full serving of vegetables. Although I made sandwiches, I’m going to think out of the box and try some of the yummy Manwich Recipes soon! Check out these Manwich TV Ads to whet your appetite. Which Manwich flavor do/would you like best? We have a Manwich night at least once a week. Personally, I go for the thick and chunky sauce. I love it! I’ve always loved Manwich but didn’t realize they made a bold flavor. I’ll have to check it out! Mmmmm, I love Manwich! I like the original the best, but the bold is also darn good. Ya know, I dont think I’ve ever had Manwhich! I’ll have to try it sometime! I’ve never heard of it before now. That stuff looks delicious! Happy Monday Donna! I hope all is well hon! I’m a HUGE manwich fan! Sloppy Joes are so simple to eat, add some fries, and cole slaw and your done. Yummy! Yummy, I haven’t had a Manwhich in a long time. This looks great. I have not had Manwich in a long time. I think it is time to add it to my shopping list. It’s been a while since we had Manwich. It’s a nice product to keep on hand for days when we don’t know what to make but we just haven’t bought it lately. I had no idea Manwhich was that healthy for you. It has been like forever since I had it. Would you know what the sodium is per serving? I had so many of these growing up, SO GOOD! I love Manwich. Personally I don’t see much difference between the regular and the bold version at all. I love the many things I can do with Manwich. We love eating it on fries too. It took a couple tries to get my kids to enjoy it, but they now love it too. We haven’t had Manwich in a long time. Maybe we’ll try the bold kind next. Shockingly enough I have a can of Manwich in our cabinet that we need to use on these I’m sure. I can honestly say I don’t think I’ve ever had Manwich before, but it looks pretty good. i love manwich. it is great and easy to make and makes dinner prep easy. Yum, that looks so good…and easy! Thanks for sharing! 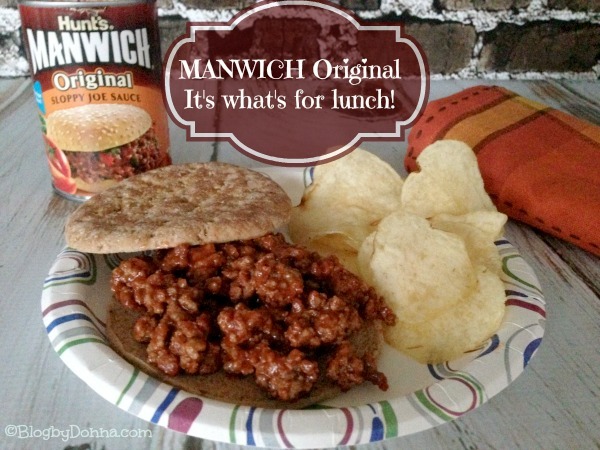 i have a kid that is so picky but he loves manwich! We’ve only tried the original flavor at our house. Manwich is such a warm childhood memory! That was one of the quick dinners mom would make when we were crunched for time and there never ended up being enough! Everyone always wanted seconds! I haven’t had Manwich in forever. I’m not even sure which flavor I’d like. We don’t have Manwich over here on our side of the pond but I’m sure I would love it! Yummmm! For some reason mu kids don’t like Manwich, so I have to make a homemade lighter version. But, I love Manwich though. I love Manwich but haven’t heard of the Bold variety! I need to pick some up.